My husband works less in the wintertime. That is to say, he still works his regular full-time job, but the marina he co-owns is closed for the season. He still works there part-time doing paperwork and preparing for the upcoming summer (booking bands for the bar and sending out dockage contracts, that sort of thing). So to keep himself busy during this relatively slow period he started building things out of pallet boxes. He built us a wall wine rack for the dining room and a coat rack to hang by the front door. 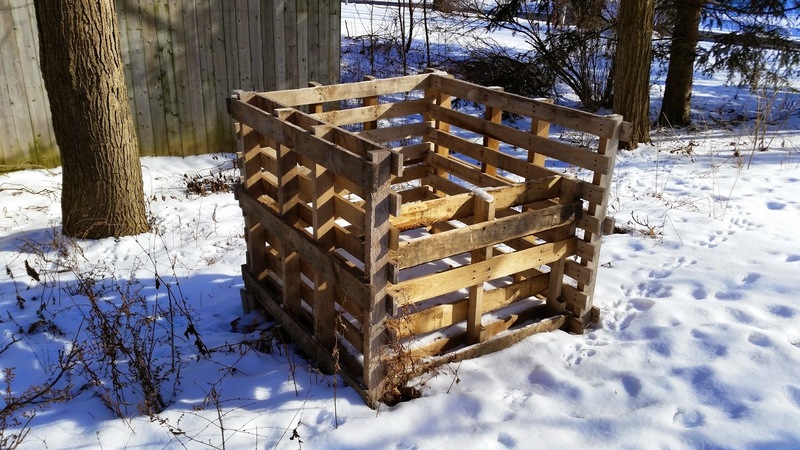 Then I reminded him that I've been quietly asking him to build me a pallet box compost bin for years. Sometimes patience pays off. I got my compost bin! Now you might be a tad confused because if you know me, you know that gardening is not my thing. While I love the concept of it, the actual reality of gardening does not appeal in the slightest. We tried container gardening a few years ago, but not a single usable item was produced. Not one vegetable, not one tomato, not even any herbs. Part of the problem is my many trees. There are just no sunny spots left in the yard. Add to that my general laziness and a lack of interest on both of our parts, and you do not have a recipe for success. Why then, you ask, do I want a compost bin? My singular goal is to reduce the amount of waste at the curb each week. It kills me to see rotten potatoes, apple cores or banana and orange peels in the trash can. I've been known to just toss old fruit and veggies out the backdoor, but this will work better for all involved. It always surprises me that none of the creatures that devour the pumpkins on the front porch at Halloween will deign to touch a potato when it's freely given. I don't mind slipping on my big boots and trudging through the snow to empty the ceramic compost container I keep near the sink. Now I just need to remember to toss the used tea bags in there each morning. And apparently, dryer lint. For a brief composting 101, check out this article/graphic. cool compost bin! Were are the photos of the wine rack and coat rack? I like your writing. Nicely written. My husband likes it too. Thank you. :-) Husband has posted pics of his other items on Facebook, so if you're curious, you could find them there.